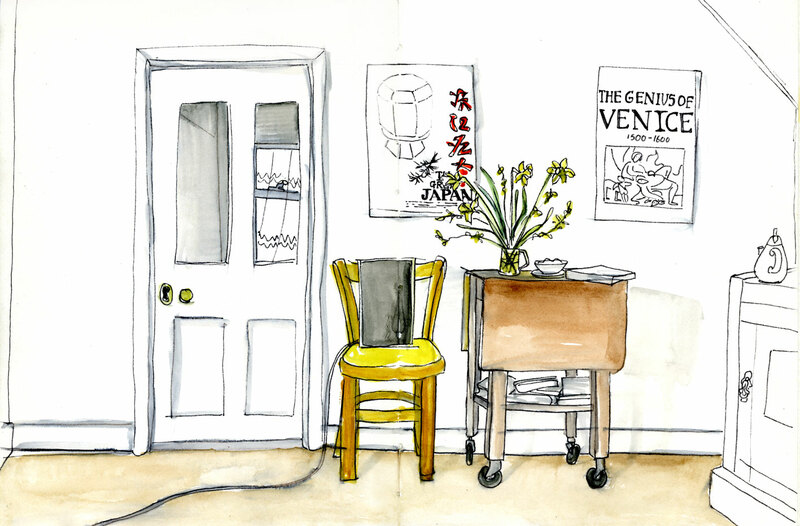 A fellow klassmate at Sketchbook Skool Lesley Bergen does the most wonderful drawings of rooms full of pattern and detail along with delightfully vivid paintings. She was talking on the skool facebook page about how her drawing style has changed, and it got me thinking, how has my drawing changed? 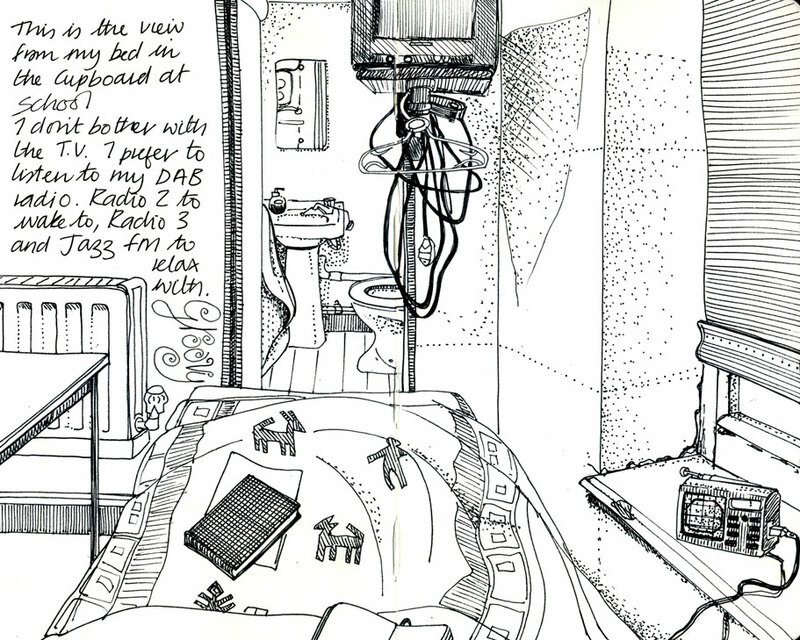 I’ve always enjoyed drawing living spaces – could I find the earliest ones from back when I was 18? I found one, which brought back vivid memories of the coldest flat in the universe where I used to warm the bed up with the hairdryer before jumping in, the sofa covered in teddy bear fur fabric and how we used to bring the speakers with the really long leads onto the roof whilst we sunbathed. 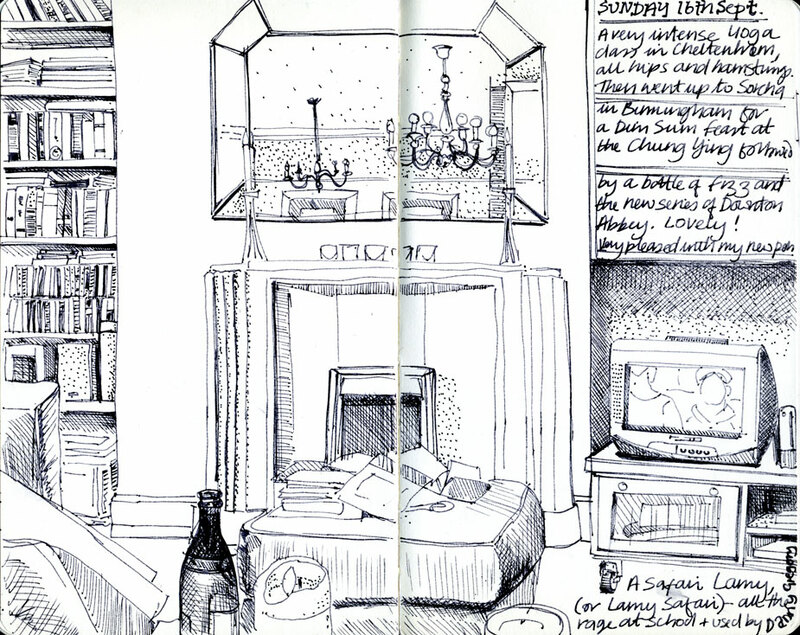 and documenting my living spaces, at home and away. Each of these drawings is a time travelling point. I look at them and am immediately transported back to the place, with the emotions, smells, people, food and conversations of that moment, all accessible again to my memory. Vivid. Each teacher in Sketchbook Skool brings their own different and sometimes conflicting ideas and styles to their classes. Responding to these challenges and absorbing their influences has been the greatest fun! Melanie Reim and Veronica Lawlor encouraged me to work fast with an view to capturing the essentials of a story in a reportage style which I talked about here. 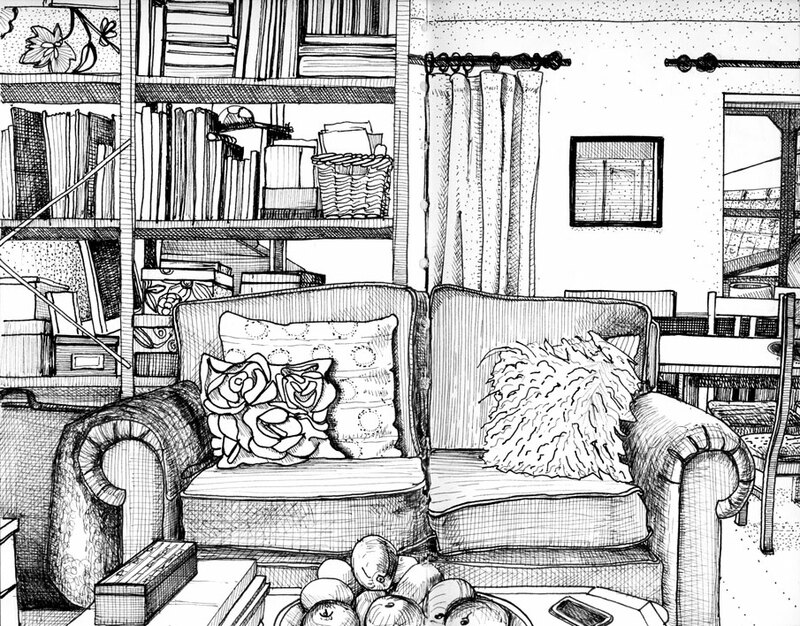 But I can see in these latest interiors that the fabulous Tommy Kane has had a great influence on me with his fine cross hatching and eye for detail. His rule that once a drawing is started, it must be finished, and his saying that ‘a mistake does not = disaster’ are stuck in my brain and surface whenever I flag or falter, allowing me to really enjoy spending a lot of time on pen and ink drawings. I am moving away from the trusty uniball eye of the early drawings because I am enjoying the variation of line thickness possible with my Lamy Safari medium nib and Pilot Prera fine nib fountain pens. I am waiting eagerly for my delivery of waterproof ink in order to be able to combine these lines with watercolour washes. 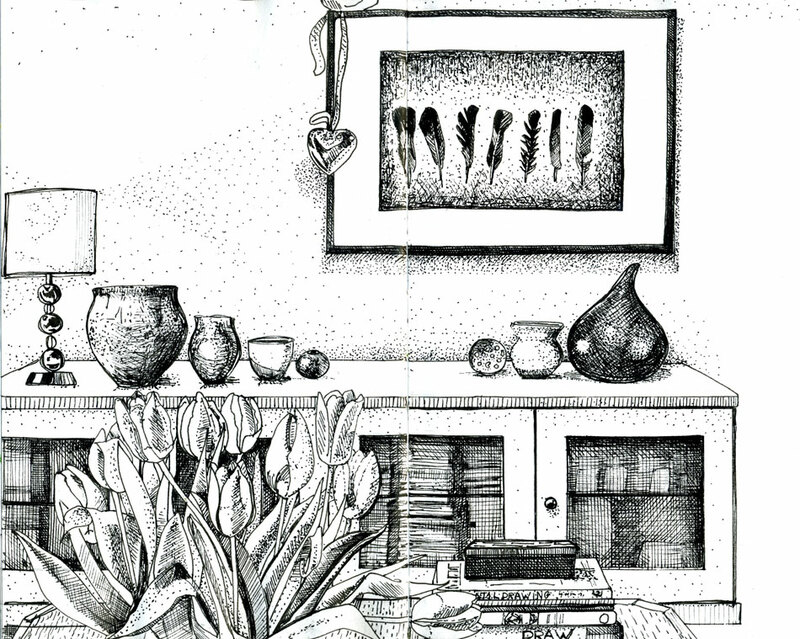 I like the look of the finely detailed recent drawings, but worry that they are too overworked – What do you think? 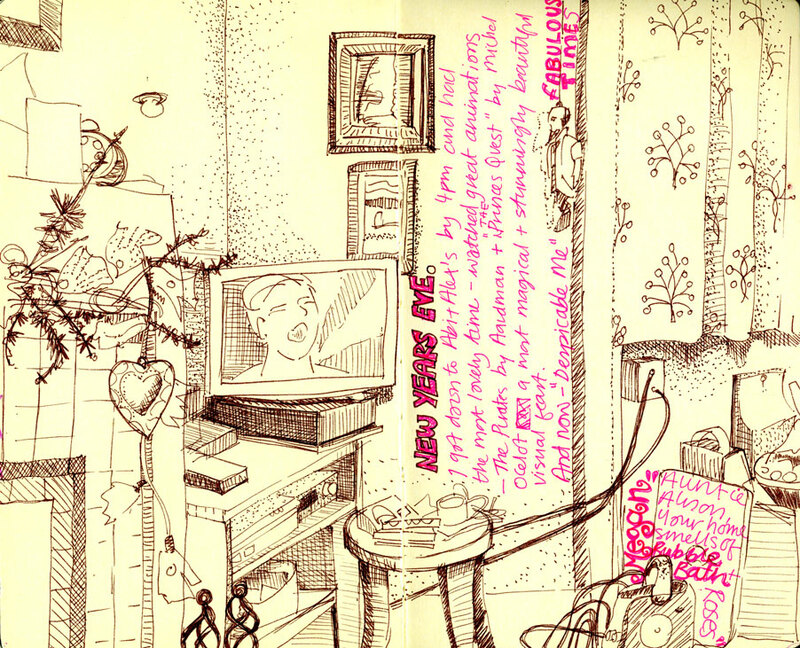 I’m glad you enjoyed looking through my books Karen, I love seeing other people’s sketchbooks too! I’m honoured that I inspire you, I admired your recent sketches on fb. I like the way you use crosshatching, which you didn’t seem to do earlier on. The extra fine nib really helps there Gabriella, I find I can get a much wider range of tones with a variety of thicknesses. I love how you selectively use colour!